First piece of advise is fly straight to Zimbabwe! We had a very expensive route through Zambia! 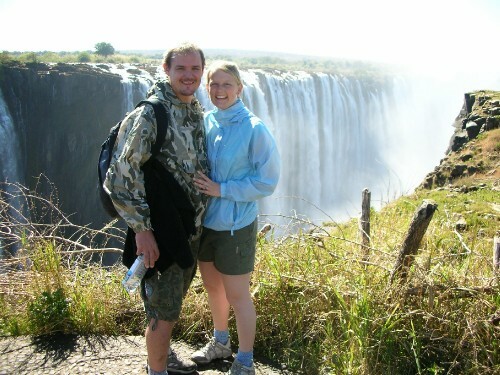 We flew to Livingstone (Zambia) where we paid $70 each then we drove to the Zimbabwe border where we paid $80 each! But the Zimbabwe side is the better view of Victoria Falls, which was amazing. Remeber a rain coat or umbrella because the spray from the falls can be quite heavy! If you have the money stay at the Victoria Falls hotel it was where the Queen stayed when she visited! Don't stay at A'Zambezi River Lodge, although the scenery is superb right on the Zambezi river the staff cannot be bothered! We went fishing on the river which was good. After a slow start we caught some bream (small ones) but no tiger fish! The money situation in Zimbabwe is quite bad at the moment as they are in the middle of changing their currency. Paying for a meal is ridiculous as it costs millions and you end up handing over a big pile of notes that is worth about 20 pounds- it is ridiculous! Also they expect you to pay in your own currency in hotels but the funny thing is you can't get your own currency or even dollars. The ATM's give you Zimbabwean dollars and so do the banks! We changed 50 pounds up at the bank hoping to get dollars but no such luck, it's a good job we had a ruck sack with us!